1. Cook the rice in plenty of boiling, lightly salted water for 20 minutes or until just tender. 2. Put the chicken pieces in a bowl with 1 tbsp of the zhoug and plenty of freshly ground black pepper and mix well. 3. Heat the oil in a large pan and fry the chicken pieces for about 8-10 minutes until cooked through, there is no pink meat and juices run clear. Remove and keep warm. Add the onions and fry in the pan for 5 minutes to soften. 3. Thoroughly drain the rice and add to the pan with the remaining zhoug, the chicken pieces, ¾ of the coriander and half the pomegranate seeds. Mix well and heat through for 1 minute, then season to taste. 5. 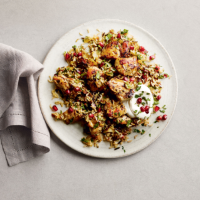 Serve scattered with the remaining pomegranate seeds, coriander and a dollop of yogurt.